Who knew that so much symbolism could be in one badge! 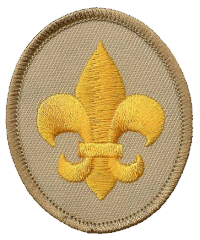 The Boy Scout Badge is in the shape of the fleur de lis (French for Iris Flower). It is also in the shape of an old compass pointing north. 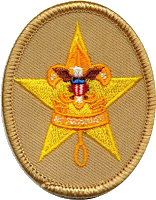 The top three points (same as the three fingers in the scout sign) represent Duty to God and Country, Duty to Others, and Duty to Self. The stars on the badge are always constant like the North Star, bringing truth and knowledge. The Eagle with the shield represent the freedoms of America and the Eagle ready to defend those freedoms. 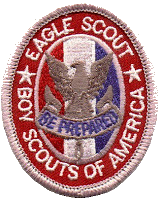 The goal of every Boy Scout is to become an Eagle. The scroll and knot are to remind us to do our duty with a smile and to always do a Good Turn Daily. As an American, I will do my best to be clean in my outdoor manner, be careful with fire, be considerate in the outdoors, and be conservation-minded. You will gain a great appreciation for the outdoors during you life as a scouter. As you learn how to camp using the principles of Leave No Tace, you will not only preserve this great land for future campouts you will go on, but for future scouters that will follow in your footsteps. I think I make a point to do at the close of every campsite is to have everyone fan out and comb the area by walking from one end of the campsite to the other picking up all trash... even if it was there before we camped. When you leave a campsite, you should always strive to make it better than how you found it. Be a boy who is 11 years old, or one who has completed the fifth grade or earned the Arrow of Light Award and is at least 10 years old, but is not yet 18 years old. Find a Scout troop near your home. Complete a Boy Scout application and health history signed by your parent or guardian. Demonstrate the Scout sign, salute, and handshake. Demonstrate tying the square knot. 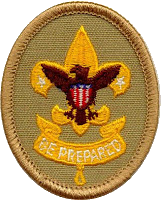 Understand and agree to live by the Scout Oath or Promise, Scout Law, Motto, and Slogan, and the Outdoor Code. With your parent or guardian, complete the exercises in the pamphlet How to Protect Your Children From Child Abuse: A Parent's Guide. Turn in your Boy Scout application and health history form signed by your parent or guardian, then participate in a Scoutmaster conference. Also known as the Joining Knot and Reef Knot, will be used many times during your scouting career and beyond. This knot was used for centuries by sailors for reefing sails and tying things aboard ship. It is important to not use this not for tying two ropes together. 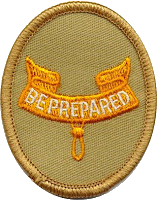 The Square Knot is used in many of the knot awards you may receive as a Boy Scout and as a Leader. The left-handed Scout handshake is a formal way of greeting other Scouts of both genders used by members of Scout and Guide organizations around the world when greeting other Scouts. The handshake is made with the hand nearest the heart and is offered as a token of friendship. In most situations, the handshake is made firmly and when both people are in uniform. For the Boy Scout Salute, make the Scout Sign with your right hand and place your index finger onto the outer corner of your right eyebrow. If wearing and official scout hat, place your index finger onto the brim of the hat. When do you use the Scout Salute?... During flag ceremonies, salute the flag of the United States of America. Also, you may salute the Flag as you pass by it, or when it passes you for any reason (parades are a good example). You may also salute fellow Scouts and Scout Leaders as a respective greeting. Remember... if at a scouting activity and not in your uniform during a flag ceremony, use the traditional method of placing your right hand over your heart and remove all hats unless it is part of your uniform. What does the Motto and Slogan mean to you? 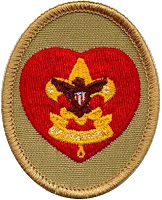 What does the Scout Law mean? 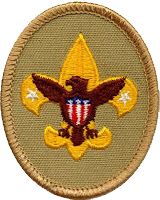 You make the Boy Scout sign with your right hand by bending your little finger down and touching it with your thumb. Raise you arm until your elbow makes a square (or right angle). You should have your pointer, middle, and ring fingers all together and pointed upwards. Your thumb and little finger represent the bond uniting Scouts throughout the world." The Boy Scout Sign is used each time you recite the Scout Oath or Law. It is also used to call the Patrol to order. If your Scoutmaster, or other Scouter, is making the sign, all scouts should make the sign also to show that you are ready for silent attention. What Does the Pledge Mean? Many times we go through the motions and memorize and repeat items without having a knowledge of what we just said. My memory is a little foggy now, but I remember standing in Elementary School and reciting the Pledge of Allegiance with my fellow classmates. Later, I remember standing in a Den Meeting and saluting the small miniature American Flag while doing the Cub Scout Salute. The next time you recite the Pledge of Allegiance, think a little on what you are saying and promising... Here are my thoughts on each line item. You will recite the Pledge of Allegiance many times as a Boy Scout. If in uniform during the Pledge of Allegiance, or if the Flag of the United States passes by during a parade, remove all un-official hats and use the scout salute. If in everyday clothing, place your right hand over your heart. I pledge allegiance to the Flag of the United States of America, and to the Republic for which it stands, on Nation under God, indivisible, with liberty and justice for all. During a Troop or Pack meeting, hold your salute until the caller indicates the salute is over with the word "two".